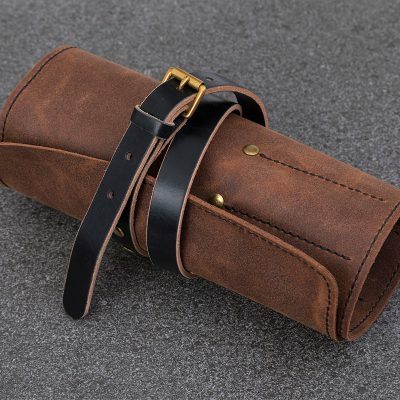 Our Brown Leather Tool Roll has a broad appeal from motorcycle and classic car owners, to those who just want something a bit different for everyday tools and general DIY. Made from high quality, durable double waxed suede leather which has an authentic worn look. Constructed with protective flap, and vegetable tanned leather strap to ensure it rolls neatly and fastens securely. Buckle and rivets are solid brass and forged in England. Hand stitched using traditional waxed linen thread.